In November 2015 the AKLDP carried out an assessment among smallholder farmers in Oromia Region, Ethiopia on the impact of bio-fertilizers on the yields of faba beans and chickpeas and follow-on cereal crops. The full findings of the assessment will be posted shortly on the AKLDP web-site www.agri-learning-ethiopia.org As often happens, the assessment threw-up an interesting non-bio-fertilizer related finding. In order the finding is not lost it’s been selected as the subject of the first AKLDP blog. The subject is post-harvest loss (PHL). The expression ‘post harvest losses’ means a measurable quantitative and qualitative loss in a given product[i] that can occur during any of the post-harvest system phases (harvesting, transporting, threshing, winnowing and storing) and takes into account not only physical losses but also deterioration of the harvested product, that might result in a restriction of use. The illustration commonly used by experts, is that grain partially damaged by insects may no longer be suitable for human consumption or for sale, but can be salvaged by using it for animal feed. While the damaged grain is usable in this manner, the restriction in use results in either a food or income loss to the farmer. The FAO (ibid) estimates that PHL in cereals and grain legumes crops in many developing countries is commonly between 10 to 15% percent, although in some regions of Africa and Latin America, higher rates of up to 50% are recorded. PHL estimates similarly vary between different projects and researchers in Ethiopia. For example, the AKLDP recently adopted a PHL figure of 13% in cereals as a parameter in a ‘food availability diagnostic’ it is developing. Returning to the field assessment, the lead AKLDP research for the study – Dr. Nigussie Alemayehu – met Shalo Wakeyo, farmer in Sagure-Mole kebele, Arsi Zone and learned of an interesting on-farm trial that had been carried out in 2014. Apparently, Shalo decided he wanted to know – once and for all – whether or not he should join the increasing number of smallholder farmers in Arsi Zone that hire combine harvesters to harvest, thresh and winnow his wheat or whether he should continue to harvest his wheat as his father had before him, including threshing with a team of cattle treading out the grain on the family threshing floor. Shalo Wakeyo farms two hectares of land. Both planted to wheat, he decided that he would harvest one hectare with a combine harvester, while the second hectare would be harvested traditionally allowing him to compare the yields between the two harvesting methods. At the time of harvest, Shalo hired a combine harvester from a private contractor at a charge of Eth birr 40 per quintal or USD2 per 100kg. The second hectare was harvested primarily with family labour and the threshing done with cattle that Shalo owned. While family labour and indeed the use of the cattle could and perhaps should have been costed, Shalo waived these costs and focussed instead on incurred expenditure and yields. Dr. Nigussie asked if the standing wheat crops were comparable and was informed by Shalo that while they were not absolutely uniform across the whole 2ha that they were sufficiently comparable at least to himself as a farmer, to enable the yield and cost estimates to be made. Shalo reported that from the hectare harvested by combine, the yield was 40 quintals or 4t/ha. In contrast the hectare that was manually harvested and threshed with cattle yielded 32 quintals or 3.2t/ha. The loss was therefore 20% or 0.8t/ha. Shalo had therefore calculated that at the same rate of loss across the 2ha that in that year his harvest would have been reduced by 16 quintals or 1.6t/ha and that based on 2014 wheat prices the cost of the losses would have been Eth birr 7,280/ ha or USD364/ ha or a total of USD728. Discounting the hire charge of the combine harvester, the loss is reduced to USD348 or a total of USD696 which is equivalent to USD1.9/day for a year. Wheat and wheat products account for approximately 14% of the total caloric intake in Ethiopia. Wheat – together with teff are preferred foods in Ethiopia – and demand is increasing especially in urban populations, with rising incomes. In 2014 Ethiopia imported 1.1 million metric tonnes of food including 400,000mt wheat through the Ethiopia Grain Trade Enterprise (EGTE). The EGTE wheat was sold to millers at subsidized prices to help stabilize flour/ bread prices in Ethiopia’s urban areas. Theoretically, every tonne of wheat grown and sold by Ethiopia’s farmers can substitute a tonne of wheat imports, although some argue domestic and imported wheat are not perfectly substitutable. [ii] While tourists to Ethiopia may therefore happily take photographs of cattle treading out the grain from wheat and other crops on traditional threshing floors, the cost of such traditional harvesting methods to individual farmers and, if aggregated across hundreds of thousands of farmers, to Ethiopia is simply too high. Change is fortunately already well on the way and recent estimates suggest that Ethiopia has a minimum of 2,000 combine harvesters traversing the central wheat belt[iii]. 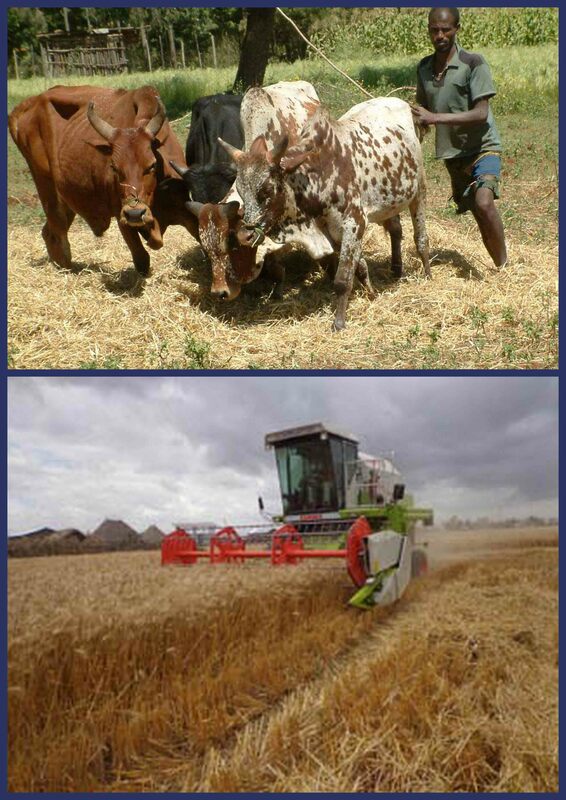 Perhaps the contribution these machines make to Ethiopia’s impressive increases in wheat yields – from 1.25 to 2.5 mt/ha in 10 years[iv] – is under -recorded as yield improvements are more typically reported as the result of improved seed and the increased use of fertilizers. However, if by switching from traditional methods to harvesting by combine harvester reduced losses for Shalo by 20%, it would seem likely that mechanization also played an important role in increasing national wheat production. While this is interesting, perhaps the more important findings are that Shalo’s story confirms that farmers the world over are engaged in farm-level innovation that often goes unnoticed and unreported by researchers, project implementers and extension service providers. Thanks to Dr. Nigussie for bringing this interesting piece of information to the AKLDP’s attention. [ii] See Tadesse Kuma (2014) Food Price Hike and Policy Response in Ethiopia: Imapct of wheat subsidy and cerals export ban. In Demese Chanyalew, et al. (2014) Proceedings of Conference Held in Addis Ababa June 2014. Chapter 9, Addis Ababa.